Jack's wingman suspected the cause of Jack's crash was a 37mm anti-aircraft round hitting one of his 20mm ammunition magazines, exploding the 20mm shells, and blowing off a large part of the wing. I went to the U.S. Naval Air Museum to see exactly where the magazines were located and how big they were. This aircraft had four 20mm cannons and four magazines, two in each wing. I can easily see how a 37mm shell could penetrate the wing and detonate the 20mm shells. Most likely this is what happened to Jack's aircraft. 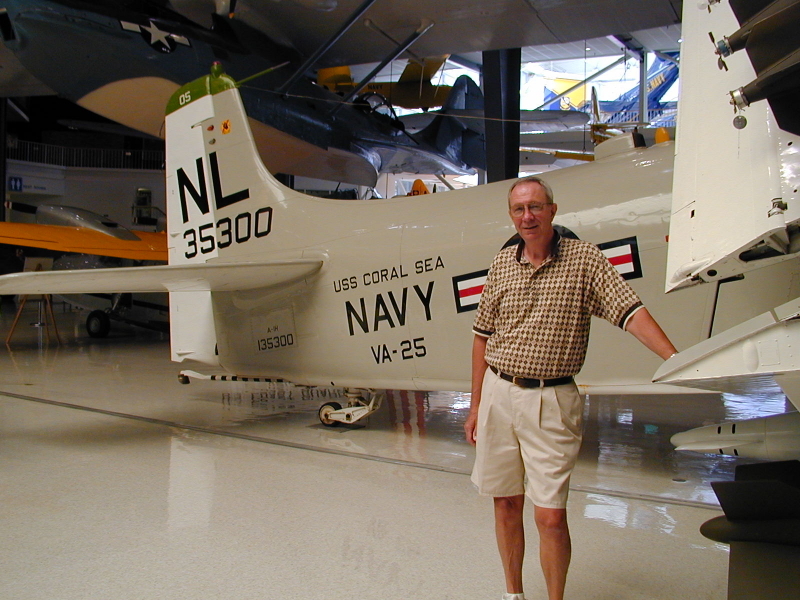 This particular Skyraider has VA-25 markings along with "Coral Sea" on the side of the aircraft. Coincidentally, I believe Jack served aboard the Coral Sea while assigned to VA-25 on his previous WestPac cruise. You can navigate through this site using the links on the top of each page and return to the main memorial web site by clicking on the link at the bottom of each page. Click on any of the pictures to see a full page display of the picture. Click here to return to Jack's main web site.